If you love the combination of chocolate and pecans, get ready for the DELICIOUSNESS that is Chocolate Pecan Pie Cake! Ahhhhh. This homemade chocolate cake recipe is sure to become an instant favorite. 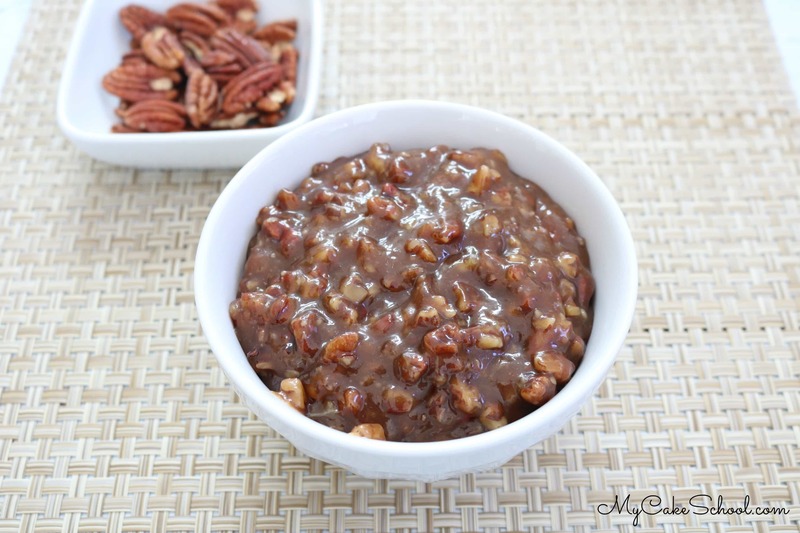 We’ve made fabulous cake recipes in the past that incorporate chocolate and pecans, but the unique & flavorful pecan pie filling makes for a dessert that is out of this world! With Thanksgiving just around the corner, we wanted to create a recipe that would truly be centerpiece-worthy! This one definitely is, and is guaranteed to please any crowd with it’s decadent chocolate cake layers and pecan filling and topping. The homemade chocolate cake layers used for this recipe are from our Classic Chocolate Cake. We often use this decadent chocolate cake recipe as it is extremely moist and has a luscious, velvety texture. This cake recipe calls for the reverse creaming method of mixing, which elevates the moistness and gives it a slightly tighter crumb– but if you prefer the fluffier texture of cakes that use the traditional method of mixing, you can find an alternate version here! Classic Chocolate Cake (using traditional method of mixing). 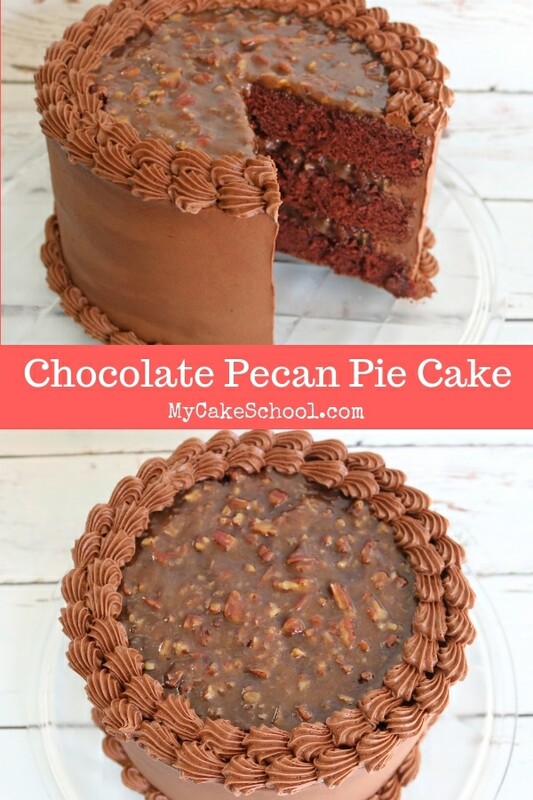 To make a chocolate pecan pie cake, bake up your FAVORITE chocolate cake recipe. We LOVE our Classic Chocolate Cake recipe as mentioned above. We divided the batter between three 8 inch pans, baked, and cooled on a cooling rack (still in pans) for about 15 minutes before flipping onto cake cardboards, wrapping with plastic wrap, and freezing. (You do not have to do the freezing step, but we always do it when time allows because wrapping & freezing cakes while still warm increases their moistness.) You can thaw them, still wrapped, at room temperature before decorating. Prepare the pecan pie filling by heating the brown sugar, eggs, butter, corn syrup, vanilla, and chopped pecans in a saucepan over medium heat until it comes to a boil. Once the mixture begins to boil, stir constantly for about a minute, then allow to cool and thicken. When it’s time to assemble the cake, place the bottom layer of cake on it’s own cake cardboard or pedestal. Pipe a dam of chocolate buttercream about 1/4 inch from the edge of the layer, and spread your pecan pie filling inside. Repeat for each layer. Next, frost the cake in chocolate buttercream. I only spread a thin layer of buttercream on top since I wanted to spread on a layer of the pecan pie filling. (I spread the pecan pie filling over most of the top of the cake, leaving a fairly wide border around the edge large enough for a couple of shell borders.) My shell borders were piped with a tip 21. Chocolate Italian Cream Cake is a chocolatey twist on classic Italian Cream Cake, frosted in an amazing Chocolate Cream Cheese frosting. Always a favorite! 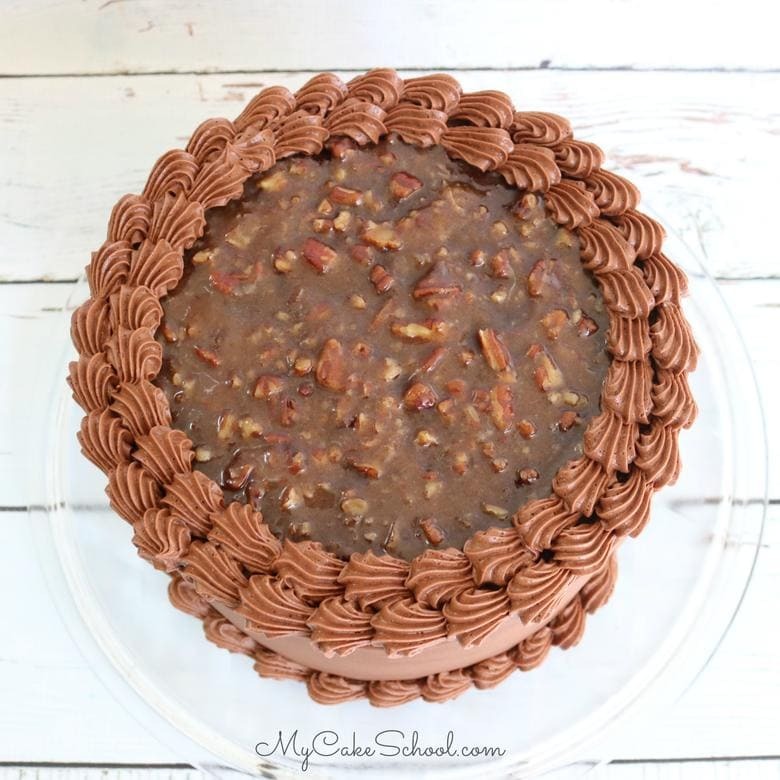 German Chocolate Cake is another tried and true classic recipe that features chocolate and pecan just as our Chocolate Pecan Pie Cake does. Only this time it is German chocolate, and the pecan filling includes coconut also! 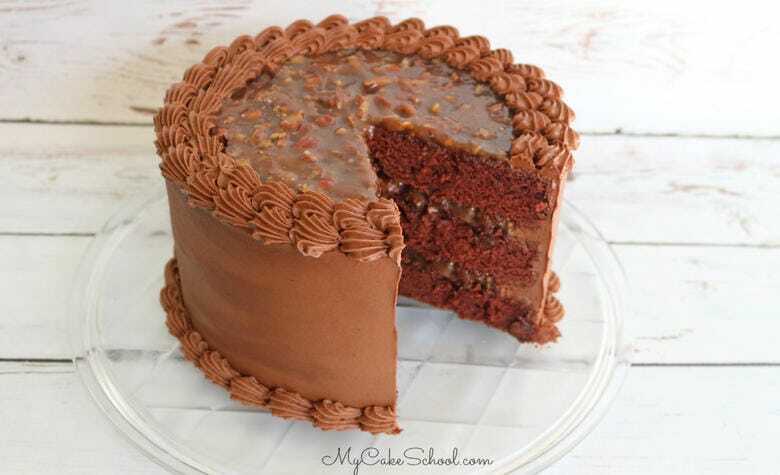 If you’ve never had German Chocolate Cake, or if you’ve been searching for the PERFECT German Chocolate Cake recipe, look no further! 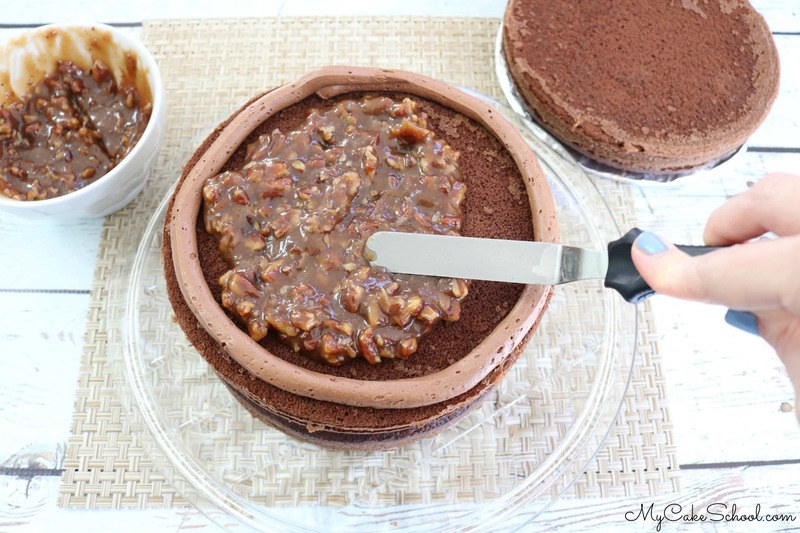 We hope that you enjoy this Chocolate Pecan Pie Cake recipe! Keep it in mind for Thanksgiving or Christmas celebrations, or any occasion that calls for something delicious! *Don’t miss our full collection of the BEST cake and frosting recipes in our Recipes Section! Also, if you are interested in cake decorating, be sure to check out our Free Cake Tutorials Section, or consider becoming a member of My Cake School for full online access to every cake decorating video tutorial that we’ve made! We’d love to have you! This cake is a decadent, flavorful homemade chocolate cake recipe paired with a heavenly pecan pie filling! This recipe is sure to become an instant favorite! In a medium saucepan, combine all the ingredients. Cook over medium heat bringing to a boil. Once it comes to a boil, stir constantly for 1 minute being very careful with this hot boiling sugar. Remove from the heat. Allow to cool to room temperature. Add butter and beat for approximately 1 min. on medium speed. Add vanilla and blend into the butter. Add powdered sugar and cocoa powder. Add most of the milk. Begin beating at low speed so you won't have a cloud of powdered sugar in your kitchen. Beat at medium speed 1 minute. Reduce speed to low and beat an additional two to three minutes, adding remaining milk as needed. This is my favorite chocolate frosting! Recipe can easily be doubled or halved. This recipe makes approximately 4 cups of frosting. Place the bottom cake layer on a cake board or pedestal. Pipe a dam of buttercream about 1/4 from the outer edge of the cake layer, and fill with your pecan pie cake filling. Repeat. Frost the cake with chocolate buttercream (a thin layer on top is fine.) Spread the top center of the cake with the remaining pecan pie filling and pipe a shell border or two around the top of the cake as well as the base of the cake. That is a show stopper! It looks and sounds delish :-) Adding this to my list. Thanks ladies for all your hard work and experimenting. I know it isn’t cheap to test and perfect recipes. This sounds and looks YUMMY !!!!!! This recipe is a must try. Is anyone else having a problem printing this recipe? I get an error msg. When I go to a different recipe I’m able to print that one. Thanks. Hi Joan, thanks for posting- I just reloaded the recipe card and I think it should work now. Let me know! Thanks for trying Melissa. I tried again and still no luck. I get a msg that it cannot be downloaded. I tried printing and also just opening it and it won’t do either. I tried in several browers and no luck. Has anyone tried the cake?